Spring is here! Ok i'm a little late but you know it's still spring somewhere because of global warming. 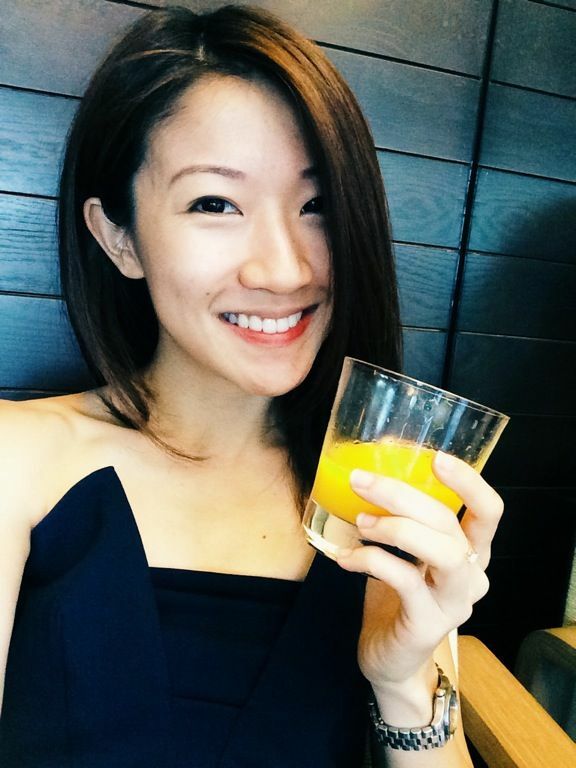 Anyhow, it's just an excuse to celebrate and where better to do so but at Brasserie Les Saveurs, St. Regis Singapore. Chef Fabrice Passicos has handcrafted some seasonal spring creations which is available till mid June 2014 which i really enjoyed. Here's a look at the dinner degustation menu! 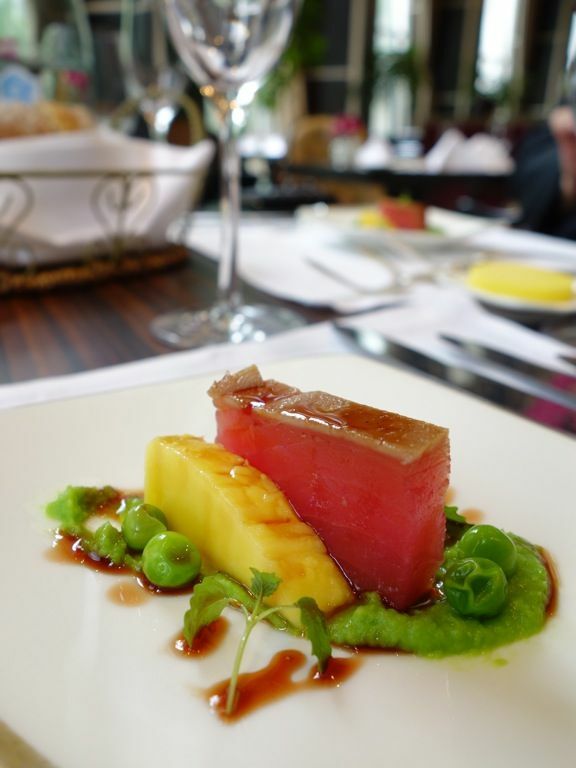 We started with the Amuse Bouche of Yellowfin Tuna Tataki served with a ripe mango and green pea pate, star anise-red wine honey and Shiso Cress. Refreshing flavors in this one. I like the tangy red wine honey. 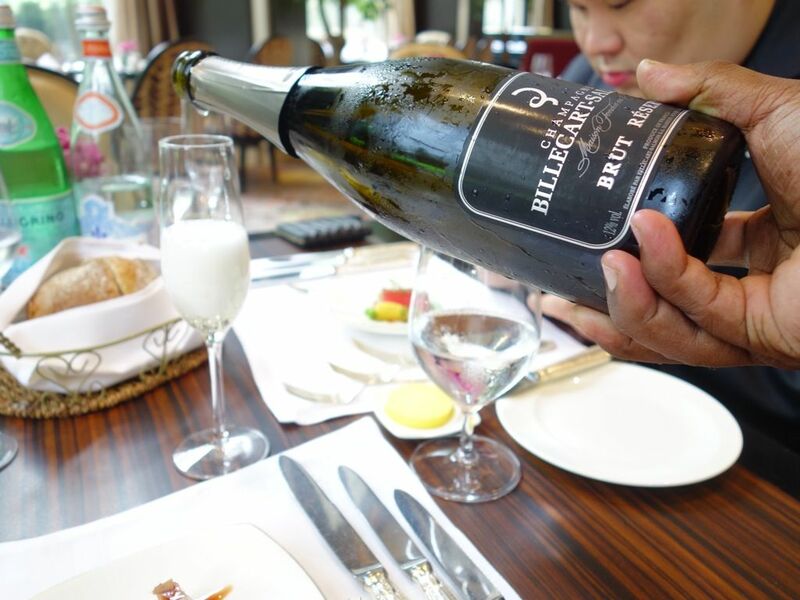 The fish went well with the delicious Billecart-Salmon Brut Reserve Champagne, NV. 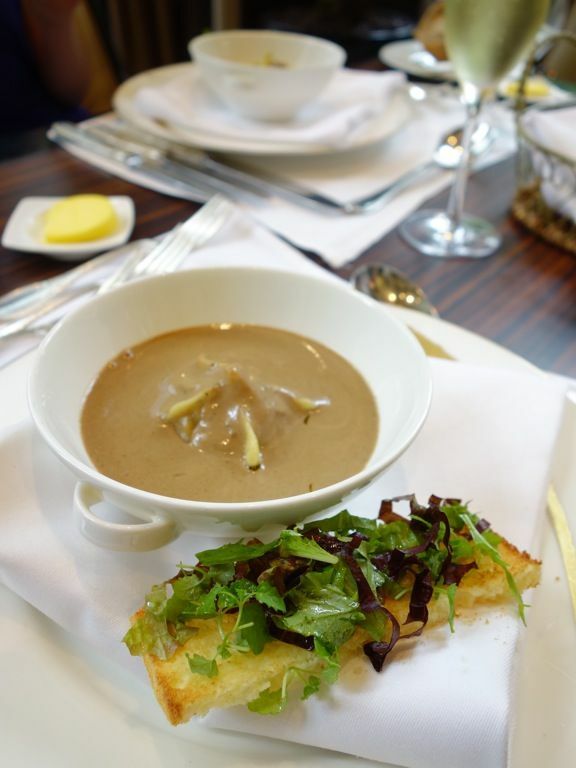 We moved on to a Light Morel Veloute and Foie Gras Custard, Herb Brioche Toast and Morel Dumpling. 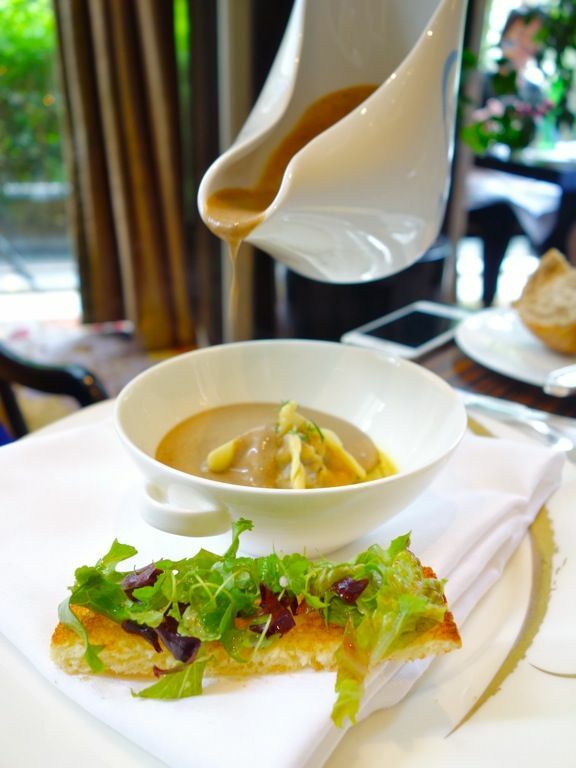 The foie gras custard at the bottom is really rich and tasty and the creamy and intense mushroom sauce was simply amazing. Well Cheryl had to work so she couldn't drink but i imagine this would be perfect with the French, Viognier, Domaine Gerard Bertrand 2012. 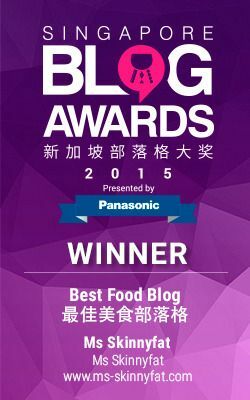 Love this dish but one may be overwhelmed with the robust flavors in this one. No issues for me of course. 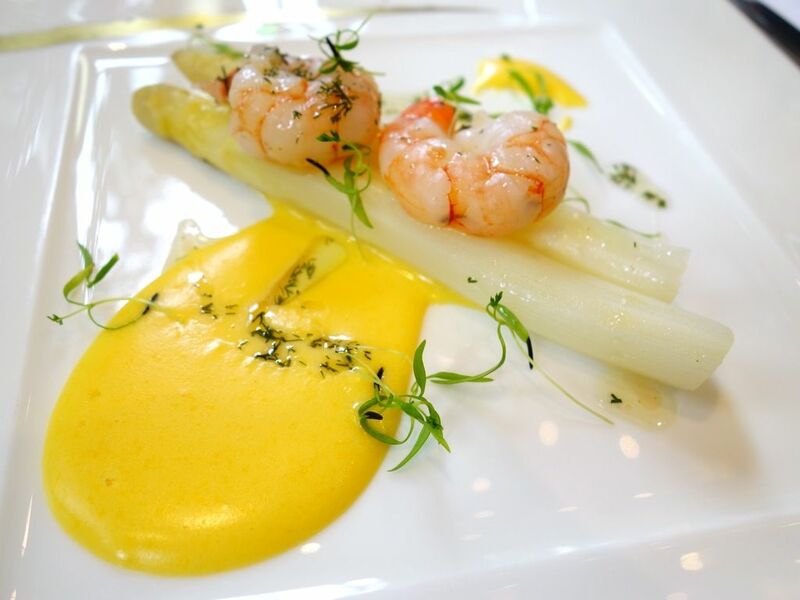 This the season for White Asparagus and we had these European ones with poached sweet shrimps simply done with dill oil. Served with a cheesy hollandaise sauce that was a little weak for me but this hit all the classic spring flavors easily. 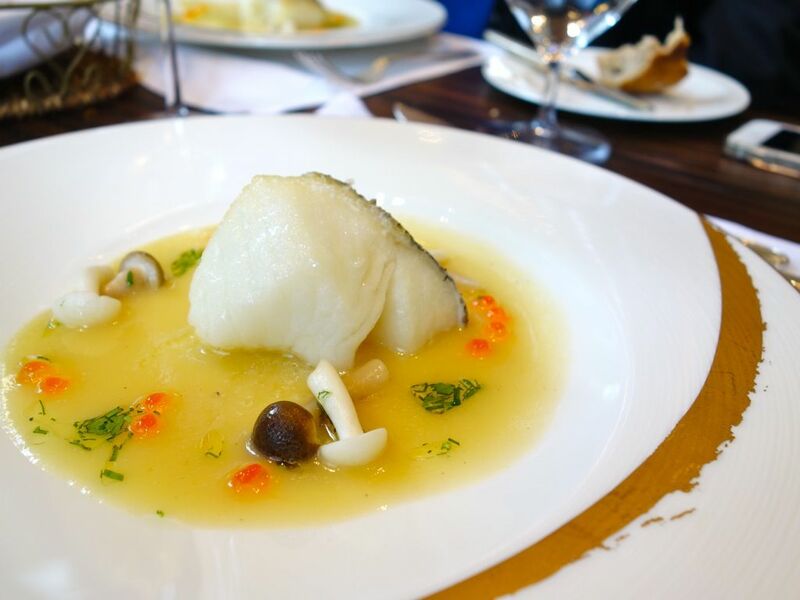 Something light and equally refreshing was the Oven Baked Pacific Cod with warm leek and cauliflower vichyssoise picked parsley, shimeiji mushrooms and fresh salmon roe. I liked how the pickled mushrooms added a little zing to the light tasting dish. Paired with the French Sancerre Pascal Jolivet 2011. 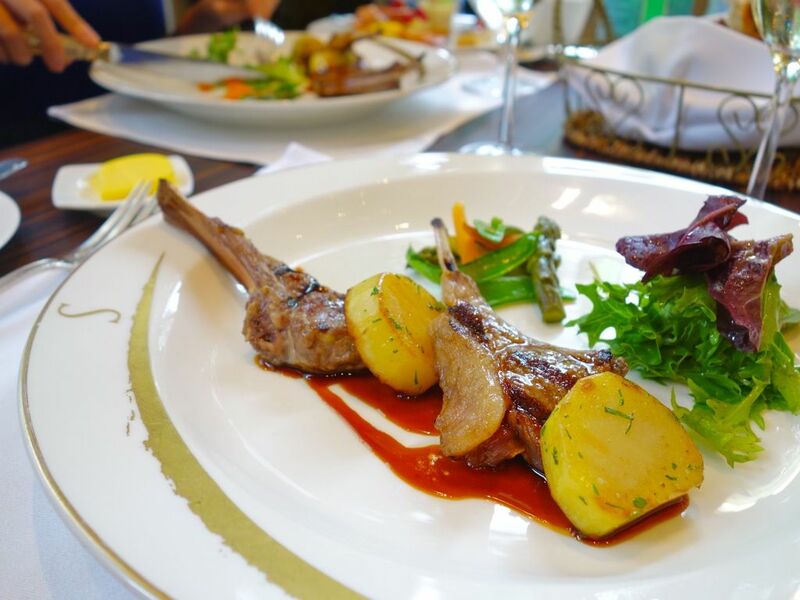 The plat de résistance, a heavenly Grilled Medium Spring Lamb Cutlets, served with sauteed potatoes, sweet rhubard compote, with spring vegs and garden herbs. The lamb was amazingly tender and juicy and the sweet and sour compote was a perfect complement to the red meat. 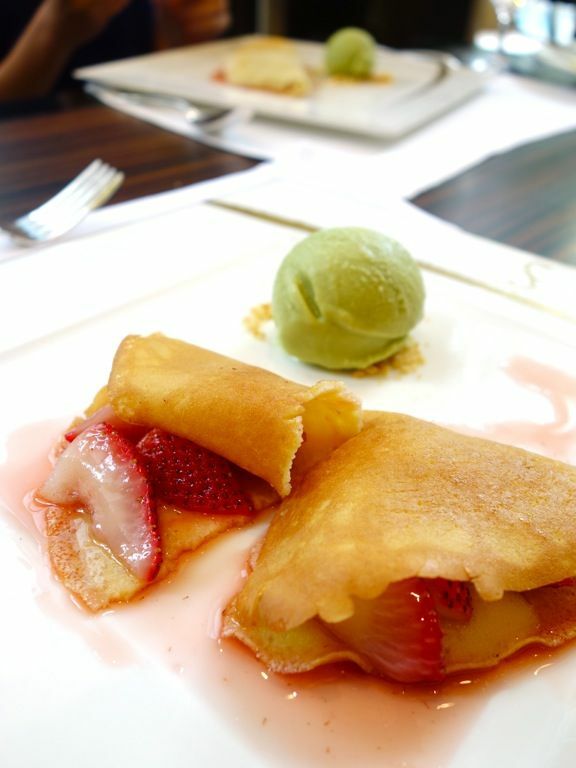 Lastly, the Fresh Strawberries Crepes Romanov. These berries are flambeed with fresh black pepper and fine vodka and aromatised with 100 years old Grand Manier (which is locked in the safe at all times). It doesn't look pretty but it tasted pretty fine! Served with a homemade pistachio ice cream and of course, concluded with a Chilean Concha y Toro Late Harvest 2011. The full degustation menu also includes the cheese trolley (love) and coffee/tea. The spring creations at Brasserie Les Saveurs are offered as special a la carte selections daily for lunch (12-3pm) and dinner (7-10pm). The degustation menu is only available for dinner and you could choose from a 5 course ($148) or 7 Course ($168) and add another $60 for wine pairing. Celebrate spring at BLS today!